Sea urchin eggs are objects of wonder for the student who sees them for the first time under the microscope. The formation of the fertil- ization membrane after insemination, the beauty of mitotic cleavage, the elegant swimming of embryos, remain an esthetic pleasure even for the eyes of seasoned investigators. But sea urchin eggs have other, more practical, advantages: they lend themselves to surgical operation without difficulty and they heal perfectly; they can be obtained in very large amounts and represent thus an extremely favorable material for biochemists and molecular embryologists. It is not surprising that, in view of these exceptional advantages, sea urchin eggs have attracted the interest of innumerable biologists since O. HERTWIG discovered the fusion of the pronuclei (amphimixy), in Paracentrotus lividus, almost a century ago. The purpose of the present book is to present, in a complete and orderly fashion, the enormous amount of information which has been gathered, in the course of a hun- dred years of sea urchin embryology. 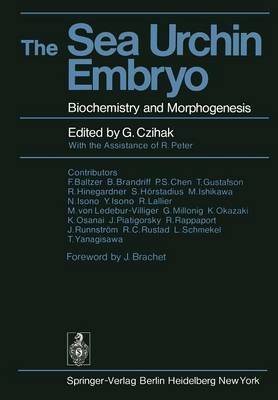 JOSEPH NEEDHAM, in 1930, was still able to present all that was known, at that time, on the biochemistry of all possible species of developing eggs and embryos in his famous "Chemical Embryology" (Cambridge University Press) . It would no longer be possible for one man to write a modern version of what was a "Bible" for the young embryologists of forty years ago.